Printed circuits have often been referred to as the “holy grail” in 3D printing. With this capability, a single machine could produce an entire electrical/mechanical device out of a digital file. This would vastly expand the productive repertoire of these machines, beyond the variety of shapes built from non-conductive plastics. The folks over at the RepRap Blog have had some inspiring success extruding a conductive metal, but there is another project attempting to do something similar. The project, 3D-PCB, is actually a software project aimed at the proliferating low-end printers. It takes the form of a library for OpenSCAD, a modeling language which allows object forms to be created using code instead of more traditional design techniques. It enables users to build circuits by placing elements of that library, the 3D-printable component holders, into orientations which become functional circuits when hand-wound together using conductive thread. The current capabilities are detailed in an instructable, and contains instructions for building a simple circuit, how to wrap it all together, and an example application: an LED flashlight. Intro — what is this instructable? Given the schematic for a simple circuit, make it a real circuit with the base components, some conductive thread, and a 3D printer. No solder, no etching chemicals, no sending away for anything. This Instructable is to serve as the how-to guide for a 3D-printed electronic circuit library implemented in OpenSCAD, 3D-PCB. I recreate the full replication process of a simple analog circuit of a blinking LED made from a few transistors, capacitors, and resistors, a single LED, and a AAA battery. I will review how to import the library, and use it to place components in OpenSCAD in a grid, and teach you the basic wrapping techniques for all the included features. Also included is a more useful example of an LED flashlight. While there are many other ways of building electronic circuits, this project has a very specific design constraint: to build an entire electronic device, including the casing, the switches, and the circuit, using only a 3D printer. 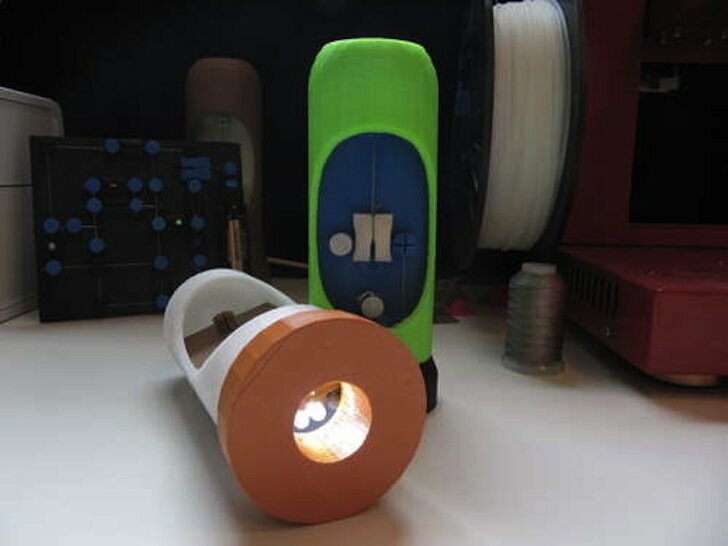 The flashlight, for example, requires 4 LEDs, 2 batteries, and several feet of conductive thread — the rest is printed. If 3D printers were able to evolve to have the capability to replicate complex electronics, it would have profound implications for just how disruptive 3D printing technology could actually be. Chris Caswell of CarryTheWhat.com specializes in 3D printing and emerging replication technology. Chris has a background in Computer Science, and a passion for open source hardware.